Replacing stained, outdated countertops can transform the look of your kitchen. Color, texture, clean lines and durable surfaces are some of the features of new countertops. Here, we discuss 11 types of countertops to consider. Granite is attractive, durable and lasts for years. When properly finished, it’s stain- and moisture-resistant and difficult to scratch. It comes in an array of colors and patterns, so it’s easy to find a piece that complements your kitchen decor. Because it comes in large slabs, there aren’t many joins. Granite can be damaged by acids. Edges can chip, and you can’t cut on the surface. It’s one of the pricier materials but not the highest. Wood gives a warm look to a kitchen. Hardwoods such as oak and maple are popular choices. Wood is handy because you can cut on it. However, it stains, burns and absorbs liquid, so it must be sealed. Marine oils bring out the grain and warmth of wood. Polyurethane creates a glossy surface and protects against moisture. Scratches can be sanded away. The cost is about the same as granite. Quartz is a beautiful option and is actually one of the hardest minerals found in the Earth. A quartz countertop is made up of approximately 93% ground quartz and 7% resins, polymers and colors. It comes in a huge variety of colors and is a non-porous material. The advantages of a non-porous material are that they’re resistant against stains and it will not allow bacteria to grow. Ceramic and porcelain tile comes in a range of colors, textures and patterns that complement kitchen décor and flooring. Tile is easy to install, inexpensive and easy to clean. It can withstand heat and liquids. However, not everyone appreciates its uneven surface, and grout can stain. Consider tile for backsplashes and eating areas if you don’t want it on all the surfaces. Sleek, contemporary and durable, stainless steel gives a professional look. The shiny, metallic surface complements any color. Surfaces clean easily and are hygienic. Stainless steel is heat- and stain-resistant, doesn’t absorb liquids and is durable. Stainless steel countertops are custom-made, so there aren’t any seams. The drawbacks are that it’s expensive, it dents and you can’t cut on it. Marble lends a timeless beauty to a kitchen. It’s available in a variety of colors and veining patterns, making each piece unique. It’s heat-resistant like granite. But because marble is a softer stone, it’s more porous and stains and scratches easily. Marble is comparable in price to granite, but needs more maintenance. Newer materials in solids colors and a wide range of prints have helped laminates make a comeback. Although laminates withstand heat and stains, you can’t cut on the surface. It’s among the least expensive materials and easy to install. Does concrete bring to mind driveways and sidewalks? Concrete countertops may surprise you. It can be custom-ordered by size, color and shape and is seamless. Concrete is heat- and scratch-resistant but must be sealed. Otherwise, it absorbs liquids and stains easily. The price is mid-range to high depending on the amount of customization. Solid surface countertops are made from mineral dust, synthetic resins and colors. They can be custom-made in an infinite array of colors and designs. The material is resistant to stains, heat and water. Scratches can be sanded. It’s strong, easy to clean and seams don’t show. However, you can’t cut on it. Newer materials have the look of natural stone but not the disadvantages. Smooth surfaces, embedded color, custom designs and seamless construction in lengths up to 10 feet give glass countertops a clean, elegant look. It’s stain-resistant, durable and easy to clean. Glass can take a fair amount of heat and weight, particularly if tempered. The cost of materials and installation is on a par with granite. If you prefer eco-friendly materials, recycled glass, metals, wood and paper are a few popular materials. Paper composite countertops are made with 100 percent recycled cardboard impregnated with petroleum-free resins, so they don’t emit formaldehyde gas or other volatile organic compounds. Paper composites are durable, non-porous and stain-resistant. Scratches can be buffed out. However, it’s best not to cut on it or put hot pans on the surface. They are moderately priced. 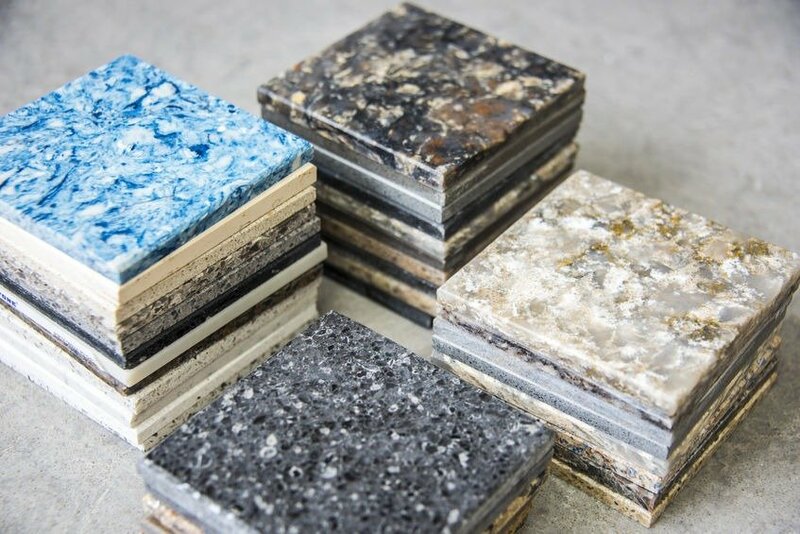 If have questions about these different types of countertop material, contact Kowalske Kitchen & Bath and speak with a specialist today. And one more to add to your list-Dekton, glass, porcelain and quartz. Difficult to cut but impervious to staining as surface is extremely hard.